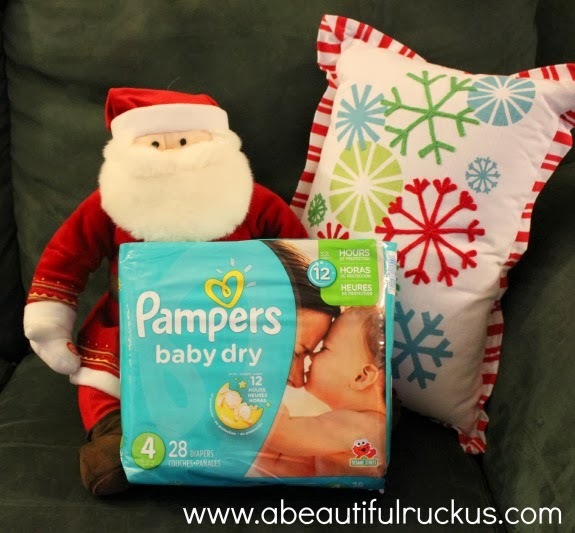 A Beautiful Ruckus: All I Want for Christmas are Dry Bums - Pampers Diapers Giveaway! All I Want for Christmas are Dry Bums - Pampers Diapers Giveaway! Is it just me, or do you also find yourself running out of important things on holidays when it's next to impossible to get more? Man, I could tell you stories about the stuff that I've forgotten. Most of the time it's an item or ingredient related to a holiday dinner, so it can be worked around for the most part. But one consistent fear is running out of something that is absolutely, positively necessary.....like diapers. Eventually, our quadruplets will be potty trained, and then it will just be a matter of keeping up with the laundry, but for now, diapers are a vital part of our lives. I've written a couple of times in the past (here and here) about how much we like Pampers diapers. Now with their new and improved baby dry diapers, I don't have to worry about the kids leaking in the middle of Christmas dinner. Pampers has added an extra layer of absorbency, making them 15% more absorbent than other brands. That extra absorbancy is enough to buy me time to run to CVS if we find ourselves short on diapers this holiday season. I guess it probably shouldn't be a surprise that I know where all of the nearby CVS's are in relation to our house. And they happen to carry the new version of Pampers in all of their stores! And now it's time for illustration two: What my kids look like with happy bums in dry diapers! No tears! Thank goodness! I've thoroughly planned ahead for Christmas next week, I think, but just in case, I know that I have CVS in my back pocket in a pinch. 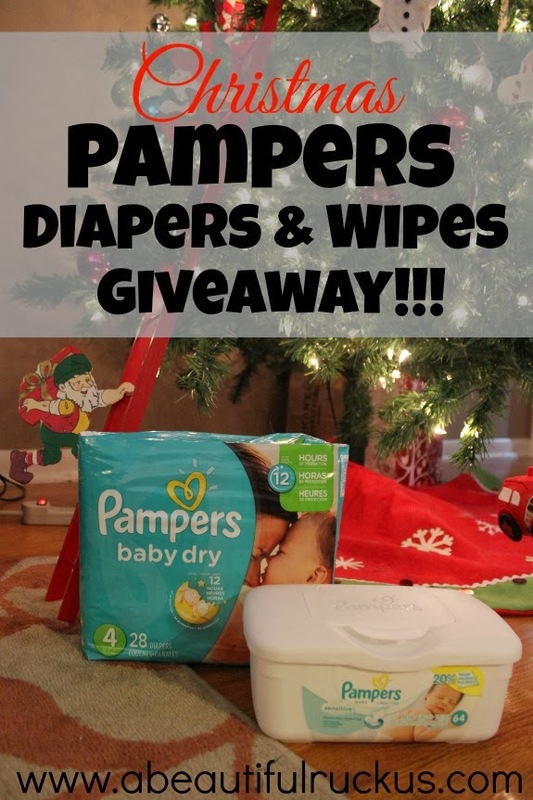 Pampers and CVS would like to make sure that you have some extra diapers and wipes just in case! Enter for a chance to win two coupons redeemable at CVS: The first coupon is for one package of Pampers diapers valued up to $13.99. The second coupon is for one package of Pampers wipes valued up to $3.99. Please use the Rafflecopter widget below to enter. Winning entries will be validated prior to announcing the winner with an alternate drawn if the entries cannot be verified. a Rafflecopter giveaway The contest ends at 11:59pm on Tuesday, December 24th. The winner(s) will be randomly chosen and contacted by email on Thursday, December 26th. The winner(s) will have 48 hours to respond to the email with their information so that the prize can be forwarded to them. A Beautiful Ruckus is not responsible for the delivery of the prize and is not responsible if the sponsor does not deliver. This giveaway is open to residents of the United States. 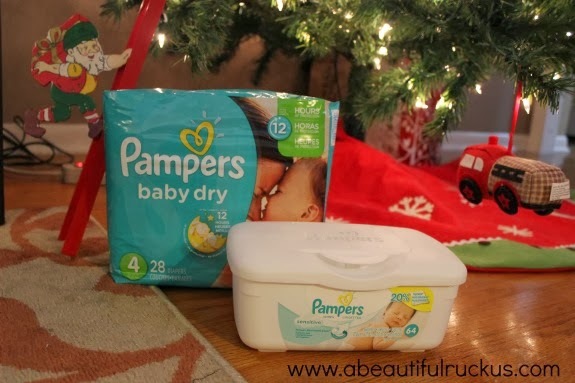 A Beautiful Ruckus received complimentary item(s) for review in exchange for hosting this giveaway from Pampers and CVS. No other compensation was provided. I was selected for this opportunity as a member of Clever Girls Collective and the content and opinions expressed here are all my own. This post may contain affiliate links. For more info, please see my disclaimer page. We ran out of milk one year because we thought we had a back up in the downstairs fridge... we did not. I sent my husband out to find a 24-hour shop that sold milk. He couldn't find one near us on Christmas Day. We just had to go without it. Batteries used to be a problem and we love in the country. A couple disappointed kids and now we know. I realized I was out of potatoes on Christmas day last year so I tried to improvise by using cauliflower blended as mash! I ran out of butter while making christmas dessert. I've been out of paper towels. I guess my fairly common story would be running out of bathroom tissue and making a quick trip to the store! Yes.. and it happens almost every holiday! lol We live in a tiny town in Northern Wisconsin and all of the stores on closed on Holidays. When we forget something like gas, milk, eggs (with 3 little ones this happens at least twice a week!) we end up having to run allll the way to Iron Mountain Michigan which is about 35 minutes away. On Thanksgiving we forgot desert and had to run for a pie about an hour before dinner since we were hosting! I am almost always running out of milk on holidays! I have ran out of baby formula on Christmas. I thought I had an extra can, but I didn't. Thank goodness my sister-in-law had a can I could borrow. This used to be a problem when I was young because where I grew up, the stores closed at 7 p.m. Now that I am an adult, stores are open 24 hours including some smaller mom and pop places. When my twins were little babies, we ran out of formula and were using the generic variety but were able to purchase the more expensive brand name easily. I havent been out of anything during Christmas. I usually prepare a week before by going to the grocery store and getting everything. If I forget a few things, I can go back a few days later but still before Christmas! I don't think we have been missing anything yet, but I'm sure it will happen! It hasn't happened to me personally yet, because my parents still do Christmas dinner, but I have been sent to the store plenty of times for last minute items! My husband fried the turkey too long one year at Thanksgiving when we had a lot of guests coming. I ran to the store and found a couple of turkey breasts that were thawed. The first time we went to visit my parents overnight after my son was born, we forgot diapers. Doh! Yes! We have forgotten to buy groceries before and the store was closed, luckily my mom had what I needed! stocking stuffers... and it was a last minute dash!!!! One year on Easter I was out of butte. My husband went to the store to buy the butter and came home with a bouquet of flowers for me. I have ran out of milk and pop before. Luckily there were still gas stations open and we were able to pick some up. My easter comment I forgot to include my email. Yes and I usually just get it at a gas station or make do without it. I prepare a couple weeks ahead and if I am out of something I catch it within days of a holiday. We seem to run out of the basics like milk, eggs or bread for breakfast. I have learned my lesson and now plan a crockpot breakfast on Christmas Eve so there is no cooking and no running out at the last minute trying to find a place that is open. I'm always running out of things, especially diapers. I actually got really lucky one time though. I'd just received a free cloth diaper from a tester website and had stuck it in the diaper bag. One day I was out shopping with the little one and she'd pooped all over her clothes and in her carseat. I was able to make due with the carseat until I got home by placing a thick blanket down. However she had to ride naked all the way home, I'd forgotten the extra pair of clothes. I was searching frantically for the cloth diaper for a good five minutes, not realizing it had slipped down under the bottle of baby oil. Needless to say, we made it home in one piece. I have never forgotten to pack diapers ever again! we always seem to forget the turkey lacing kit for Thanksgiving. One year we ran to about 5 different pharmacies and walmart looking for one. The local grocery store ended up giving us some twine to tie up the bird. I now keep about 3 kits on hand at all times. We have run out of or lost tape for wrapping last minute gifts several times. Another big one is batteries! It's inevitable that we forgot some for at least one toy every year. Thankfully, my mom has come through with extras! Random food items usually nothing house related. We would always forget some ingredient while cooking or baking. My father-in-law always ran out to get it. Oh yeah, it seems I always forget something. I usually forget something while cooking a holiday meal. Luckily my husband is often kind enough to run out to a store or 24 hour gas station to pick up the forgotten. That or I will frantically call my mom to ask if she knows a good substitute. Last year I forgot my eggs and couldn't do my last minute baking! I was so bummed! We always run out of milk when cooking sides its terrible. We always seem to have a little trickle of it and then have to substitute it for powdered milk or a little more butter. But then when we dont need milk we have too much of it and it goes bad. We ran out of milk because we were so focused on all the holiday ingredients that we forgot the basics. I had to run to Rite Aid to pick some up. for some reason we always run out of butter. You would think we would know by now to purchase extra with everything we need it for but almost every holiday we run out and someone is running to the local convience store and paying an outrageous sum for it. I've run out of pop and things to drink before. We ran out of drinks like milk and ice tea. Everyone was really thirsty. Hubby got more. I have run out of butter and subbed margarine. I don't like to do that, but it works in a pinch. Have not run out. Thanks for the chance to win. No, we've been pretty good on keeping up with supplies this year. I was out of Wondra to make gravy! I ran out of wrapping paper and we ended up using some fabric scraps, grocery bags and newspapers. Batteries. Everything was closed but a small local gas station. The most I ever paid for batteries. Eggs! We are always running out of eggs on the holidays! Luckily we keep powdered eggs around now just in case. When everyone was ready for dessert we realized we were out of Cool Whip! We had to ask the next door neighbor who luckily had extra! My daughter accidentally dropped the eggs and broke most of them, so luckily there is a 24 hour market close by and we went and bought some more, at a higher price of course. Sometimes we run out of toilet paper at the most unexpected times! Especially when I have family over. I didn't have milk last Christmas...had to run out to make the mashed potatoes. We always run out of milk! Just yesterday we had to make a run to CVS to get some! i was about to make the apple pie and didn't have an lemon juice so i had to run out and get some. we live about 10 miles from a grocery store, it was not fun! 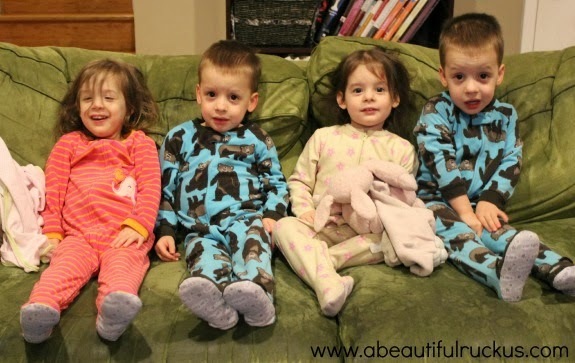 Your kids are absolutely adorable! I loved that they posed so perfectly for each type of picture. CVS is definitely a lifesaver for last minute items over the holiday season. I love the deals you can get using coupons at CVS too. I'm looking forward to seeing what 2014 brings you and your family. I'm glad we're doing the Biannual Blog-A-Thon in January. Thank you for signing up.